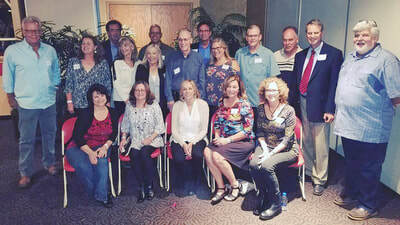 ​“Rockin’ the Foundation” certainly lived up to its name when alums from across a number of years and decades filled the Krasa Center at Benedictine University with conversation, laughter, memories and music. Guests began to pour into the party well before the 6:30 p.m. opening, some loaded with yearbooks, articles, artifacts, and cell phone cameras at the ready. Many came from smaller dinners and family gatherings with friends from their Lisle days or relatives also in attendance. “Reunion within the reunion” was a common theme in this, the fourth All-Years reunion presented by the Carlin Nalley Foundation. Thirty-three different states were represented by attendees so for many this was really a step back in time. 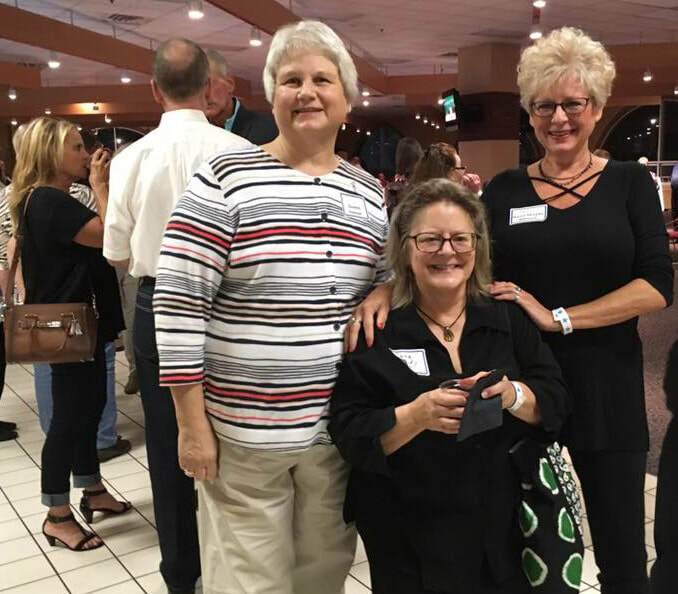 In the reunion hall, party-goers found enough background music, archived photos looped on the wall, memorabilia, and plenty of munchies. Bartenders were busy. Very busy. From there the order of the day was conversation…and lots of it. So many finding a familiar face that they haven’t seen in decades, yet after the initial hugs and handshakes, the way-back machine was immediately fired up and within moments everyone was laughing. All of this simply confirms the beauty of the “all-years” format. Lisle was a place where everyone knew so many people outside their own class that limiting who can attend seems a shame. Predictably the crowd was still pretty stout as the clock wound toward the midnight closing time. Almost as predictable was the amount of local establishments that ended up becoming “after-party” locations as midnight simply was too early for many. Jay Grochowski and Don Krause, great event! Thank you for all your work to make such a successful reunion! We would like to thank everyone that produced this event and brought us all together. Thank you for all your hard work.....it was a great evening. Thanks for all your follow up and coordinating the events. Great job!!! Great job, Don! It was a lot of fun! Thanks! Unbelievable weekend! Thank you. Thank you. Thank you! Every other year, LSHS plays five home games, four in the other years. With all the school-related ceremonies at Homecoming, the school was gracious enough to grant us an Alumni Night. This year the Alumni Night game is against the Sentinels of Westmont, Friday October 6 at 7 pm on the campus of Benedictine University in Lisle. Shortly after the conclusion of the JV game, all current and former military members in attendance are asked to join the Lions down on the track in the North end zone. With the Marching Lions playing the theme song from all five branches of service, each branch member whether Lisle alums, Lisle fans, or fans of the Westmont Sentinels walk in together as their branch’s theme song is played. A fitting tribute to all military in attendance and a staple of Alumni Night. Five Lisle alums have paid the ultimate price for our freedom and they are remembered individually and as a group with a solemn roll call, followed by a moment of silence and Taps. Steve Ford, David Garringer, Bob Arlon, Sean Cardelli, and Ryan Burris will be honored by all in attendance as their fellow alums and their school choose to never forget them. From September of 1972 through September of 1980, Lisle football went an incredible 59 consecutive conference football games without a loss. A brilliant and storied era in our school’s athletic history. At halftime of the Varsity game on Alumni Night, October 7, team members, support members, and coaches will gather and be recognized on the field for their accomplishments. Past Alumni Nights have honored Lisle’s Hall of Fame coaches, individual state champions, and team state champions. From 9 am until 11 am, alums will be able to step back in time and roam the hallways of the six buildings found in the Lisle school district. The Meadows School, Scheisher School, the Old Junior High School (now part of Scheisher), Tate Woods School, Lisle Junior High and Lisle Senior High School will be open for alums to visit and reminisce. In past All-Years reunions, school open houses have been wildly popular so this year will be no different. Legendary coach, Illinois Coaches Hall of Famer, in both football and track, teacher, Athletic Director, Superintendent, and a driving force in the early formation and programs of the Lisle Park District, Mr. Nalley touched thousands of students’ lives in and out of athletics in his decades dedicated to Lisle families. For this, his 80th birthday, we have put together the ultimate “Team” photo to give to coach as the best birthday present of all. Two photos will be taken. One for anyone who was ever involved in the football program while Coach Nalley was at the helm, and the second is the same criteria only for track and field program. Participants are to meet, rain or shine, at Lisle Junior High School’s Wilde Field. The photo will be in the bleachers and all are asked to gather at 10:30am The LSHS booster club will be grilling hot dogs for those looking to grab a quick bite between the day’s activities. New to the All-Years reunion lineup, but long overdue, we’re getting the band back together! At the BaseCamp Pub, at the foot of the ski hill in the Four Lakes Village on Lakeside Drive, Alums from across a number of decades are dusting off the old Fenders and Ludwigs and ready to rock the foundation. Instead of driving their parents and neighbors crazy while performing in the garage, these alums will Rock the BaseCamp from 1pm until 4pm. There is no charge so alums and guests can head to Four Lakes, grab some refreshments at the bar, and help the bands Rock the Foundation. Our fourth All-Years reunion will certainly set an attendance record as alums are coming from over thirty states to party with the people of their school days. Registration is ongoing at www.carlinnalleyfoundation.org For late decision-makers, the Nalley Foundation gladly accepts walk-up entries for a slightly higher fee. Snacks and some drinks are included along with a “Museum” that chronicles parts of our 60 years and creates a nice framework to walk down memory lane. The soundtrack of Lisle High School will be playing in the background, former faculty in attendance, and conversation…and some laughs. Actually, a whole lot of both. There’s also an ongoing multi-media presentation throughout the night that highlights sixty years of LSHS. Any LSHS alum is welcome and each may bring one guest. Our goal is to get as many alums and guests pre-registered as possible so we can best plan for wait staff and stock the shelves. Additional drink coupons may be purchased throughout the night. All proceeds go directly to the Carlin Nalley Foundation scholarship program. The Fall of 2017 marks the 60th anniversary of the opening of Lisle Community High School. Prior to that, Lisle students had to choose between attending school at Naperville High School (now Central) or Downers Grove High School (now North). 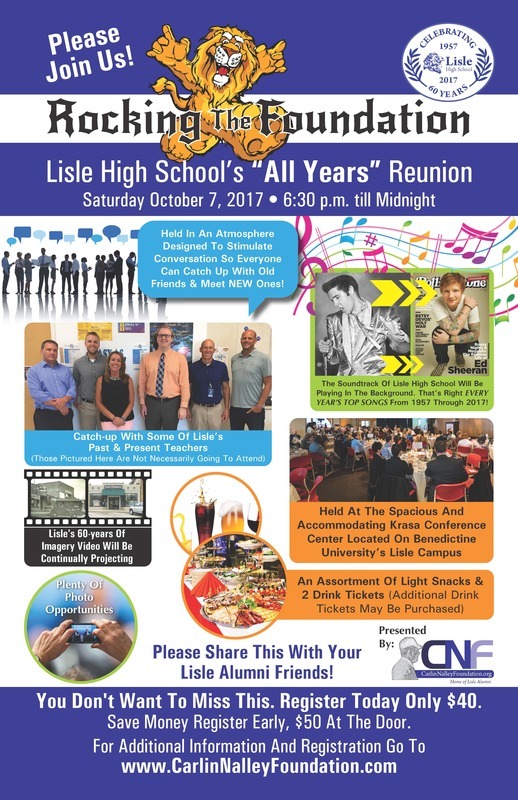 That all changed in September of 1957 and on Saturday, October 7, 2017 attendees of Lisle Senior High School will once again gather for an All-Years Reunion which promises to be quite a sixtieth birthday party. Sponsored by the Carlin Nalley Foundation, “Rocking the Foundation” is the fourth All Years Reunion of its kind, starting with the first one in March, 2008. 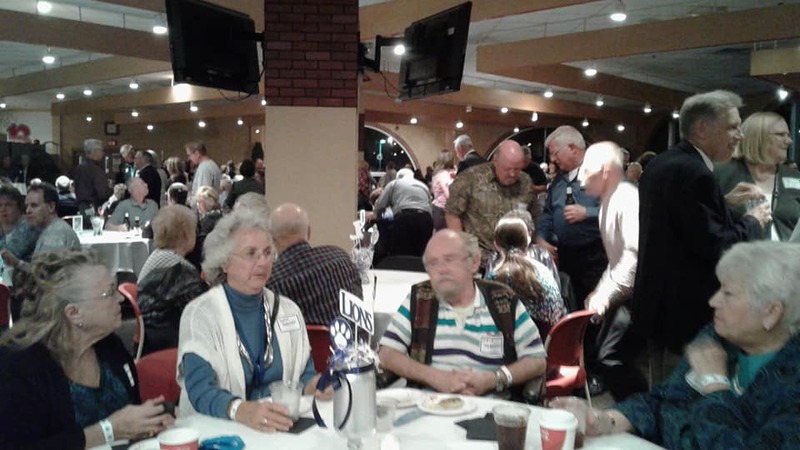 The All-Years reunion will follow the format that’s proven to be so successful the previous three events: affordable, lively conversation, hors d’oeuvres, alcoholic and non-alcoholic drinks provided, and additional drinks can be purchased. No dress code, music, memorabilia, and fun. 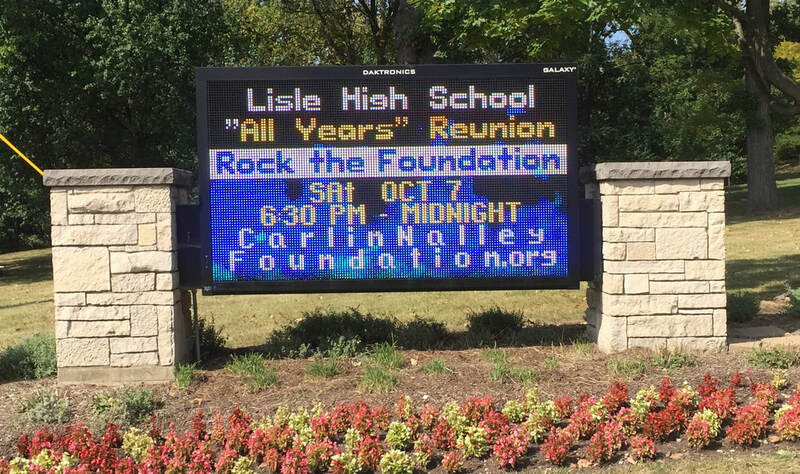 The event honors our school, supports the Foundation, and reunites the kids from Lisle from over six decades. Over 2,000 alums have attended the All-Years reunions combined. Rocking the Foundation promises to be the biggest of them all. The All-Years reunion begins Saturday at 6:30 pm and runs until midnight at the Krasa Center on the campus of Benedictine University in Lisle. Admission fee is $40 in advance, $50 at the door. Watch our website for ongoing updates and added features as the Foundation works to enhance the experience for all alums coming to Lisle Columbus Day Weekend, 2017. Attendance is limited so get your tickets early at Eventbrite (click logo below) or by mail (click mail order form below). There has been one constant in the 60-year history of Lisle’ Rock Music.” The soundtrack of Lisle High School will be playing in the background. That’s right every year’s top songs from 1957 through 2017 will be equally represented being played in a shuffle fashion, wow! If a picture is worth a thousand words. A multi-media show with images and videos covering 60 years of Lisle High School & Lisle must be priceless. Lisle High School, 60-years of Imagery will be continually playing on one of the walls of the Krasa Conference Center. Nothing like a photo with old and new friends to make special moment last. There will be plenty of photo opportunities and a couple of special backgrounds to use. Man does not live on fun alone. Included in your admission price is an assortment of light snacks & drink coupons will be provided for alcohol and non-alcoholic beverages. Additional ones may be purchased all evening. Would love to get information on this, thanks. I am interested in attending this event, as this would also be my 20 year reunion time, class of 97! Keep me updated for the class of 77, 75, 76. Keep me updated by email. I am not on Facebook! My maiden name is Wyns, graduated in 1964 and live in Phoenix, AZ. Please keep me updated on the reunion. Thanks! I would love more info on the reunion. I was in the class of 1977, but moved before senior year. It's also the 50th reunion of '67. 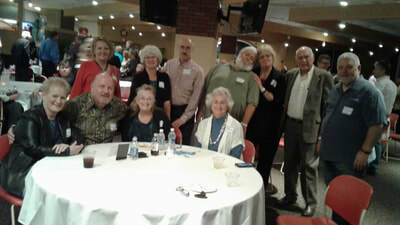 I had a great time at the last reunion and will spread the word about the next. Have the date on the calendar! I went to Lisle High for a year and a half. My brother and sisters went there. Went to the last all years reunion and enjoyed seeing a lot of my old classmates and friends. Absolutely looking forward to it.